When the Mission Rose project first started taking shape, I knew two things right off: 1. that it would involve very specific silk embroidery threads; and 2. that it would involve some goldwork threads, but not a lot. The majority of the project will be worked with silk embroidery threads, specifically with Soie de Paris by Au Ver a Soie. I used this thread for the Tudor Rose in the Medallion Project, and I loved-loved-loved it. In the photo above, you can see the colors of silk I’ve pulled for the Mission Rose. I’m not certain I’ll use all of them, but I have them on standby, just in case. It was pretty difficult to come up with a good range of greens, and I’m not too sure of the ones I’ve chosen. I also wanted a reddish brown in there, but we’ll see what comes of the browns and reds selected. One difficulty with using Soie de Paris for a large embroidery project is that it does not come in a vast range of colors and shades. Still, it has a pretty decent range (which I believe is still growing) for a smaller project. And the Mission Rose being somewhat smaller in scope than the Medallion Project, I was confident I could ferret out a good sampling of colors and shades in Soie de Paris. With this project, I obviously don’t intend to mimic the colors and shades of silks used in the original piece of embroidery that inspired the Mission Rose. 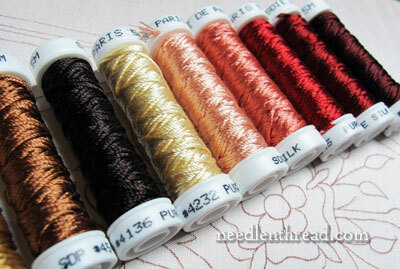 If you’re looking for Soie de Paris, you can find it available through fine needlework shops. If you have a local needlework shop that carries fine embroidery supplies (oh, I wish! ), you might check with them first to see if they carry the Au Ver a Soie range of silks. If I make changes in the colors above as I go, I’ll let you know. But for now, the colors are chosen, I’ve assembled them in a tray along with a selection of #10 crewel needles and my favorite embroidery scissors, and I’m ready to stitch! Well, almost – one more little job before the stitching begins. And I’ll share that with you next time! Questions? Comments? Have your say below! Dear Mary, I am looking forward to see how this project develops . 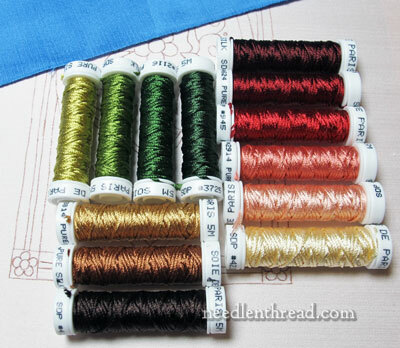 Just one question, how thick is this silk thread you will be using. I must say it looks beautiful and I can only but admire it from a very far distance. The silk threads look wonderful! I was admiring them on the HH site yesterday. Can’t wait to see how they look on the fabric. 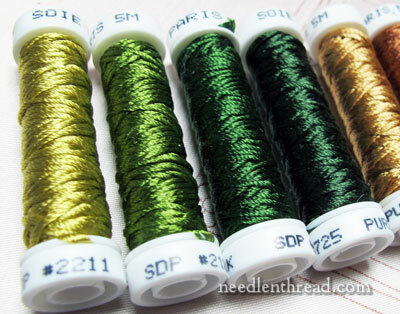 I just discovered that I live not terribly far from a store that stocks a mountain of thread (http://www.designersdeskusa.com) and I’m a little afraid for my wallet now. The threads/colors are beautiful! Do you use them as is, or do you divide them into single threads for use? Hallo Mary, Ik wil Heel graag meedoen,maar kan in Nederland niet Silk Paris kopen. Graag geven Nr van DMC?? I love following your projects. I learn so much because you are not afraid to let people see that you too make mistakes. The way you explain your thought process helps me so much. I was just wondering how many strands you will be using on this project? Thanks so much for the post I love the colours of silk thread you’ve chosen for the Mission Rose project. I’ve not used Soie de Paris thread they look lovely and silky and I’m looking forward to see how you use them and how they look against the silk fabric you’ve chosen. I’m really looking forward to the development of the project. I LOVE, LOVE, LOVE Soie de Paris to work with. They have recently broadened out their color range with some of the historic colors. Check with your store and see if they have some of the new ones in yet. Hedgehog Handworks sells Dovos. If they’re not listed just ask. I’ve bought two pair from the ‘hog (so far). Previous Previous post: Carrickmacross Lace Kit & Curved Scissors – A Give-Away!